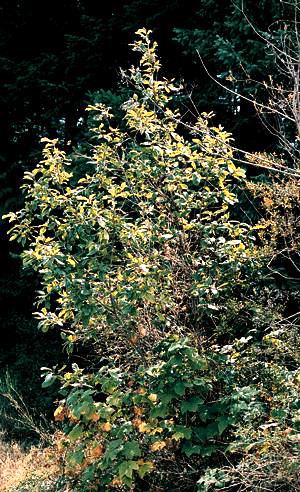 A small tree or shrub with greyish-black bark that grows to 10 metres tall. Alternate, oblong leaves have fine teeth along their edges and prominent veins running parallel to the sides. It is the only deciduous tree in the province whose buds are not covered by bud scales in the winter. Nondescript, greenish flowers, clustered near ends of branches. Thin, dark greyish-brown; smooth when young, becomes scaly with age. 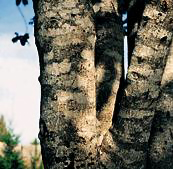 A cut in the bark reveals a bright yellow inner bark that turns dark brown on exposure to air and light. It is found on the southern part of the coast and Vancouver Island and in scattered locations in the Columbia Valley in the Interior. Cascara grows under conifers on rich, well-drained soils with plentiful summer moisture. Streamsides and wet areas are favourite locations. The Nuu-chah-nulth people used the wood to make chisel handles, and the Skagit people produced a green dye from the bark. Coastal people also knew it as a tonic and as a laxative. 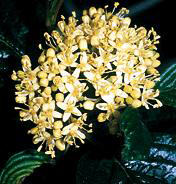 Cascara was harvested throughout its range for use as a laxative. 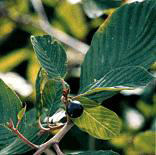 Bitter cascara extract has been used in liquors and a debittered extract as a flavouring for drinks and ice cream. Honey from cascara flowers is also reported to have a mild laxative effect. Originally, people collected only the fresh bark, but soon the wood was discovered to contain 50 percent of the active compound. Legislation regulated cutting to prevent over-harvesting. The legislation was rescinded after a synthetic source was developed. Spanish priests in California named the tree Cascara sagrada, meaning "sacred bark." This name has two possible origins. The first is from the medicinal properties of the bark and the second from its resemblance to wood used for the ark of the covenant. Rhamnus is the ancient Greek name for the genus.